Yesterday while tidying up I found the Vogue magazine that I had been reading in the hospital before my hysteroscopy. When I picked the magazine up, I found some photos tucked inside that I’d never seen before. They are photos of my uterus — from the inside! Something I never ever expected to accidentally find lying around the house. Never ever ever. I knew that Dr. Full Steam Ahead showed the photos to DH, but I didn’t know (since I was unconscious at the time, and DH never mentioned it) that he gave us a copy to take home. And therefore I also didn’t know that DH tucked the pictures into Vogue. Surprise! No, that’s not a Dolce & Gabbana maxi dress, it’s your empty womb! DH was 100% right when he described the photos simply as pink. Randomly discovering photos of your uterus… one of those moments that only infertility can deliver. If you’d like to see what else people have brought for Show and Tell this week, head over to Miss Lollipop’s circle time. It’s a pretty safe bet that no one else brought a uterus. If someone else also has internal photos of their reproductive organs, I would be so embarrassed! Embarassed at the duplication, not at showing the world pictures of my hoo-hah. That is no problem, obviously. After more than 7 years, I am back on The Pill. Just for a few weeks — don’t worry, I haven’t given up TTC. It’s the pre-cycle before IVF #2, which will start in mid-December. Finally! This week I saw Dr. Full Steam Ahead for the post-op appointment following the recent hysteroscopy. I’ve never seen him so optimistic. He all but guaranteed a baby from this next cycle. It was encouraging, but at the same time it’s a little hard to believe. He is aggressive, obviously, or he wouldn’t be named Dr. Full Steam Ahead, and I don’t think he’s the type to make promises that are flatly false. But, after so many big and small letdowns, including the first injectible+IUI cycle this year where I was sure something would finally work after all these years and then M/C #2 after IVF #1 this summer, it’s really difficult to put my whole heart in it. But I am somewhat hopeful that it may finally work, perhaps if not with IVF #2 then maybe with the FETs that follow, or IVF #3… optimistic, but not overly optimistic. I will not be writing about Thanksgiving today. Not that I am not thankful for many things, but we are not doing Thanksgiving this year. At all. Instead, to make it easy for ICLW commenters and also to make it easier for me to do a good deed, I would like to enlist the help of the Internets. I’ve seen so many of my infertile bloggy friends on bedrest for weeks or even months, so some of you may have firsthand experience, and the rest of you are full of good ideas, I’m sure. One of my relatives just had major surgery. He’s going to be okay, but he’ll be immobile for a while. So, if you were going to create a care package for someone who will be stuck at home, essentially unable to move, for a couple of months, what would you send? I will start the list out with the obvious. DH and I just watched this week’s Law and Order: SVU. (By the way, the episode, “Persona”, talks a lot about fertility and reproductive rights — try to catch it online or when it gets rerun; by then you’ll forget my spoiler.) A couple in their 60s are talking separately to the detectives. The husband says that they weren’t able to have children and that the wife was diagnosed infertile. The wife says that she was secretly on the pill the whole time (it sounds horrible, but it makes sense in the context of the plot). DH: How could the husband be so blind for so long? Any husband would know she was on the pill that whole time. DH, stony faced: That is the least funny thing you have ever said. I think it’s hilarious. You? Yes, so anyway, back to the task at hand. So, I told you about how, to console myself, I wandered into a local fair trade clothing boutique. I stumbled upon socks that bestowed peace upon me, because I realized that I could bring someone else a smile and hopefully some good luck in an upcoming cycle. First, I present the socks. They are hand-crafted in Vermont by The Sock Lady of Solmate Socks out of recycled cotton. They are purposely mismatched — which seems especially fitting for those of us for whom things haven’t always gone as expected. They are really cuddly. I can’t vouch for the fit because I didn’t want to try on socks that I’d be giving to someone else, but the saleslady said they’re extremely comfortable. The worthy recipient of these socks will be Miss Conception. She was nominated by Merlot from Swimming Against the Tide. Here’s a little summary of Miss Conception’s history, in her own words. We have been trying to conceive since 2000, have gone through 6 IUIs, 2 fresh IVFs, and 2 Donor Embryo cycles. We managed to get pregnant with twins but lost them at 8 weeks last December 13th. We got pregnant again in April, but lost that pregnancy 8 weeks later. We started to pursue adoption in 2005 and are waiting for a referral from China sometime in 2011. We were considered by a birthmom in the summer, but she chose the other couple in consideration. It’s been quite a rollercoaster ride. Miss Conception is past due for some good luck. Please join me in wishing her all the best in her upcoming FET and beyond. Thanks also to Merlot for nominating such a worthy recipient. If you’d like to see what else people have brought for Show and Tell this week, head over to circle time. One nice thing about having a blog is that I have an audience to whom to relate the special moments of my life, even when they don’t relate to IF. I was just in my local upscale supermarket (largely organic, locally produced when possible, etc.) and was surprised to round a corner into an aisle and almost walk straight into a cameraman. He was filming a mother and her 5-year-old son “shopping.” I assume they were filming a local television ad for the market. From what I could tell, the mom is a regular shopper, not an actress. She was going about her shopping, but she was playing up certain things for the camera. The boy was entirely being himself. As they were setting up for the next shot, the cameraman made an offhand observation. My instinct tells me that certain scenes may end up on the cutting room floor. Show and Tell coming soon… Happy ICLW! This week’s Perfect Moment was hard won. Recovering from Friday’s hysteroscopy meant that I had to wait until Sunday to head to the pottery studio. When I arrived, two of my pots had finished going through the glaze fire. I’d used both to test a new glaze, so when they ended up ruined (bubbly glaze that had run and stuck the pots to the shelf), I wasn’t concerned. Then I realized that another piece I’d done should have been fired too, but I couldn’t find it anywhere. Then I realized that another piece was missing. And another. And another. Consulting the detailed notes that I keep on each piece, there were at least half a dozen that had disappeared. Several of them were fantastic pieces that I’d been working on for months; some of the best work I’d ever done. I’m a very inconsistent potter, and plenty of my stuff ends up being total crap, but several of these could legitimately be sold professionally, for a lot of money (though these were all intended either for me or as specific gifts). My first thought was that someone had stolen them all. Because of work and travel, it had been a few weeks since I’d been in the studio. In that time, someone must have recognized their brilliance and snatched them! They only left the two mangled testers. Bastards! The dream I’d had about all of my pottery being gone when I got to the studio turned out to come true! Well, almost — there were some unglazed pieces left. But some of the very best ones ever, including the replacement for the wonderful pot I broke a few months ago, were gone. With some of the others, I had tested and expanded my limits as a potter. Some of them were pieces I’d attempted half a dozen times before finally succeeding with this one. Many of them involved literally hours of finishing work such as hand-carving designs. And now, they were gone. All gone. I was absolutely livid. I called the pottery teacher at home, but no one answered. I was bursting with rage — it has been years since I have been this angry. I was so pissed that I could not bear to stay another minute. What if everything else I make will also get stolen someday? I packed up everything and headed out in a huff. On my way out, I thought I would mention it to the lady at the front desk (who has nothing to do with what goes on in the studio), just to document the outrageousness. Me, shockingly calmly: I can’t find a bunch of my pottery anywhere. I can’t imagine where all of those pieces would have gone. Lady: Oh, were those part of the kiln fire that got destroyed? Lady: It was awful. The entire batch was totally destroyed. All of the shelves collapsed and I guess everything got crushed. It wasn’t malice after all, it was… human error? Mechanical failure? Random chance? someone else’s. But it’s never happened before that so many pieces shuffled off this mortal coil, all at once. I had exceeded the limits of my Zen non-attachment. I was no longer angry, but still very stunned. Unfit to drive, I walked into a nearby boutique that sells free trade clothing and gifts. I’d bought a gorgeous handbag there a couple of months ago (vegan leather, but you’d never guess it! ), and thought I’d calm myself down with some retail therapy. And then I found the socks. 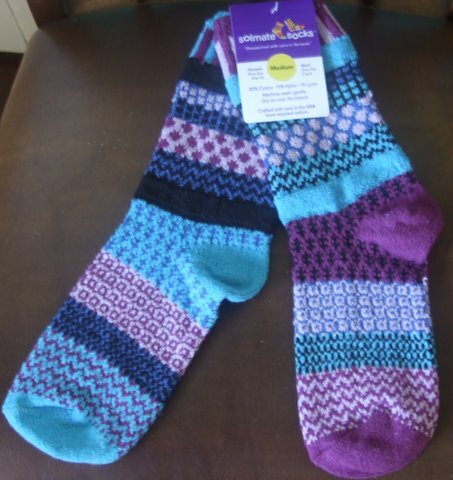 Delightful, hand-knitted socks made from recycled cotton. So soft and comfy. Beautiful color combinations. Whimsical patterns. My first thought? Good luck socks for an IVF or IUI! But not for me, for someone else… one of my bloggy friends! In this act of altruism, so much of my negativity dissipated. I spent at least 10 minutes carefully choosing a pair. Imagining someone else’s delight at receiving them. Visualizing the socks shuffling down the hallway of a hospital or clinic… a brave woman wearing nothing but a hospital gown and these socks. Hoping that these lucky socks might indeed turn out to be lucky for their wearer. And slowly, a very very imperfect moment became a Perfect Moment. Were these meant for you? Or maybe someone whose story you’ve been following? I would love to send these socks to someone who will be doing a cycle in the near future. I’d like to hope that they’re carrying some good karma after all of this. Please nominate yourself or another blogger in the comments — or by email [babysmilinginbackseat at gmail daaaaht com] if you want to keep the nomination a secret. In case there are multiple nominations, to break the tie please include a guess as to the color scheme I picked out (there are several colors represented, so just name a couple of colors). The other tie-breaking factor is that I’ll need to get a mailing address from the recipient, so if you nominate someone who does not consent to receive them, that person will un-win and I’ll have to give them to someone else. I will reveal the socks and the recipient at Show and Tell next weekend, so you have until Thursday night 11/20 at midnight Eastern time. Postscript: The socks didn’t entirely cure my mood. When I got home, I explained the day’s horrors to DH. He declared that pottery is never supposed to be stressful, because that is what I do to get away from stress. We decided that maybe I should create my own studio at home rather than working in a public space (still thinking that over). He was sweet, kind, attentive, fun, helpful, encouraging — even moreso than usual. Call it Perfect Moment #2 — I have Perfect Moments with my husband literally almost every day, but this time he was truly exceptional. Head to Weebles Wobblog to see more Perfect Moments. Let’s hope that everyone else’s days were more unequivocally perfect.